45 years after the car rode into our living rooms and stole the show and our hearts (speaking as a boy of the 60’s) the Batmobile has never been available as a licensed full-scale replica. Until now. As someone who has attempted to go down the licensing path with DC and the ’66 crews multiple times in the past 15 years (only to fail or give up from the turbulence) getting this off the ground is a bigger feat of engineering than any gadget on the Batmobile. The involvement by the “Big Corp” (you know, the one that actually OWNS the property in question) on any Bat-property is inevitable. And, though this may surprise some of you to hear coming from me, it’s a good thing. It’s better for just about EVERYONE . It’s better for fans, it’s better for quality control, and it’s better as another step forward in getting TW/DC to acknowledge the revenue potential that the ’66 property brings to their catalog. The black market that has existed and been perfected over the years is what has directly proven to them that this is a viable business to pursue, whether with 1:1 cars or the scale model world. It took us, the members of these boards, the fans, the black market builders and customizers doing decades of market research that they’ve been too shortsighted to bother with to make this dream real. And now that they’ve turned the page and awarded the license, and it’s time for all the Jack Sparrows to sail away to Tortuga, it’s ruffling some feathers. 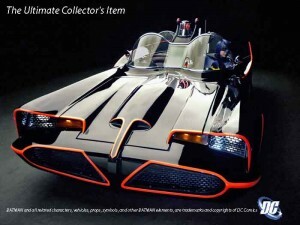 Let me share some unasked-for advice here with some of the other 1:1 scale Batmobile replica builders – when something like this happens, if you’re not the ‘chosen one’, it’s best to go quietly into the night, look back at the GREAT ride you had making profit on someone else’s idea, and call it a day. Trust me on this. Nobody called the Pony Express business owners up the day after the telegraph was invented to see if they were going to be okay. Nobody cares about you. Consumer’s thoughts go with progress and change. If you can’t roll with that, get our of any business that involves customers. Seriously. DC picked Mark Racop’s Fiberglass Freaks to exclusively make and sell officially licensed batmobile…er, sorry Batmobile® replicas. It’s an honor, but anyone that has ever met Mark or seen his product knows that he’s the obvious choice. I’m only surprised because it shows more intelligence and taste than I would ever have given DC credit for. Personally I think that capping Batmobile® production at 8 per year is a great thing. And it gives us all something to save up for.